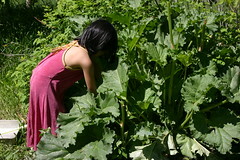 It’s definitely summer now and the garden is starting to produce some favorites – like rhubarb. 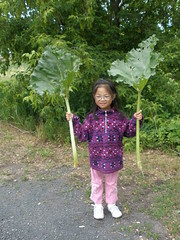 Here Olivia is holding two stalks of rhubarb from the garden. The leaves have to come off before they come into the house since they are poisonous to cats. So far, we’ve enjoyed rhubarb sauce, crisp, and coffee cake. Sophia has requested a rhubarb pie. Before long, it will be time to can some rhubarb sauce and freeze some cut-up rhubarb for use during the winter. Although Sophia and Olivia had already harvested the first rhubarb of the season last month, today was the day to make rhubarb pies. 3 of them. 2 standard 9″ pies, and one miniature pie. The pies needed 9 cups of chopped rhubarb. That’s quite a bit once you start chopping. I make pie crusts from scratch…an old recipe from my Grandma…that uses lard, flour, salt, sugar, and water. Instead of all-purpose flour, I used a trio of flours today: all-purpose, whole wheat, and bread flours. Although the pie was fine (thanks to a Betty Crocker recipe), the crust wasn’t as light and flaky as it is normally. So much for trying to make something a bit more healthy. Next time it will be back to the unhealthy (but tastier) pie crust. In addition to the rhubarb, the strawberries are producing this year which is great. Fresh from the garden, organic strawberries. The flavor is incredible! Looks like we’ll be making lots of raspberry jam this summer…a favorite one that we enjoy all winter long. 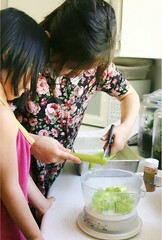 Summer is a great time for the girls in terms of homeschooling. 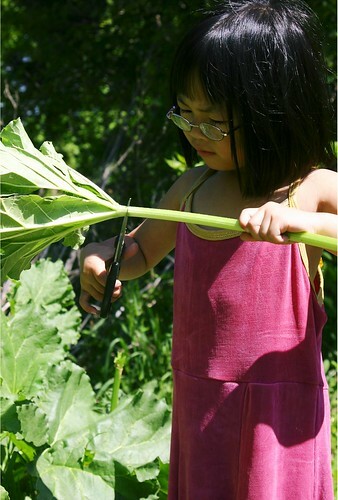 There are so many hands-on lessons that they are able to do – especially related to gardening, nature, and science. Home economics and cooking is a big part of summer as well as they learn the old-fashioned skills – like canning – that they can enjoy now and as an adult.